Standout Stone Cottage Designs . . . Picture Perfect! The picturesque stone cottage designs featured here encompass a broad range of storybook styles in both England and the United States. Designed to evoke nostalgic charm, they most definitely succeed! There is something about stone cottage designs that tugs at our heart-strings. Romantic and picturesque, they conjure up images of our favorite childhood stories . . . . . particularly those with fairy tale endings! 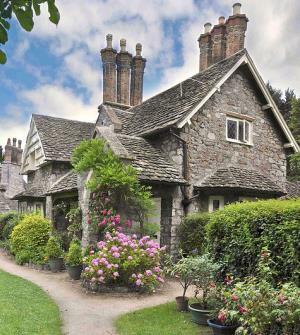 Few, if any, stone cottages are more picturesque than those at Blaise Hamlet (below) in northwestern England. Like something out of a storybook, they epitomize the ideal of a fairy tale cottage! See More of the Fabulous Cottages at Blaise Hamlet! As with the designs pictured above, the romantic English cottage that follows features a beautiful thatched roof. The Gothic Revival cottage pictured below, left, is a private residence that was once a rectory. On the right is a quaint English cottage, made even lovelier by the climbing ivy and hanging baskets of colorful flowers. Stone Cottage Designs . . .
Hopping across the pond to North America, we find the period revival cottage pictured at right. Extremely popular during the 1920s and 1930s, the style is enjoying somewhat of a resurgence in popularity today. The remaining images that follow depict stone structures that are not currently used as live-in cottages. However, their picturesque architecture makes them great candidates for romantic stone cottage designs! Pictured directly below is a stone and shingle outbuilding at Skylands, a New Jersey Botanical Garden in Ringwood State Park. The old mill pictured below is in the Black Hills of South Dakota. It would make a great cottage for weekend getaways . . . . . or even a year-round dwelling! The fanciful stone designs that follow would also make terrific cottages! Located on Heart Island in the Thousand Islands, Alexandria Bay, New York (near the U.S./Canadian border), they are part of the Boldt Castle family compound, begun in 1900 by hotelier George C. Boldt. Pictured at right is the "Hennery," or Dovecote -- the first structure to be built on the island. The structure pictured below with multiple towers and turrets is the original Power House. It was built to house a generator to supply the island with power, but now is more of a museum that shows how electric power was obtained in the early 1900s. The stunning Alster Tower, pictured below, is often referred to as the Playhouse. According to the official Boldt Castle website, "Its design suggests a defense tower similar to those on the Alster River in Germany. This building was intended for the entertainment of guests. The 'Shell Room' was to be used for dancing and was so named because of the shape of the roof. The basement housed a bowling alley and plans for the upper floors contained a billiard room, library, bedrooms, cafe, grill and kitchen. The Playhouse was closed for many years due to the deterioration of the edifice, but since extensive renovations, is now open to visitors." Regardless of which stone cottage design or designs you prefer, the little cottages pictured on this page will stir the imagination and tug at the heart. And why not? After all, they are "picture perfect!" Please check back often or subscribe to our RSS feed, as we frequently add new images of stone cottages to our site. Highlands to the Hills of Tuscany! The French (& English) Connection!